Hardwood floors are robust, comes in many varieties of woods, patterns, stains, and finishes, they are natural and environmentally friendly, stylish and eye pleasing, hypo-allergenic, affordable and easy to maintain. There are a number of cleaners on the market that state they are for hardwood floors. Your best approach is to purchase a cleaner produced by hardwood flooring manufacturers or floor finish manufacturers. These can be bought from local hardwood flooring retailers or big box stores that sell hardwood flooring. 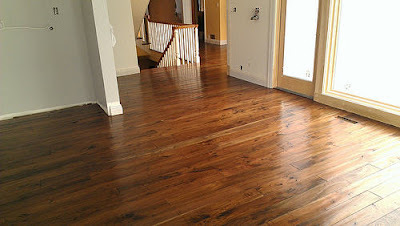 Best approach is the Hardwood retailer who specializes in hardwood. Squeaky cleaner manufactured by Basic Coatings is a good product and so is Mirage cleaner. If you use cleaners that are not appropriate for your floors it can leave some sort of film on the wood surface. This can make buffing and recoating in the future difficult to achieve due to adhesion problems. Can I use oil based cleaners as well? If oil based cleaners is used on polyurethane finished floors it leaves an oily residue on the surface. Which not only make cleaning the floor difficult, but after a period of time when the floor is showing signs of wear, and needs to be buffed and recoated, this residue can give some adhesion problems. When cleaning any hardwood floor only minimal water should be used: wipe with a dampened, not wet, cloth. Adding a capful of vinegar can help and is suggested by the National Wood Flooring Association. But I have heard one floor finish manufacturer disagree on that, believing the vinegar is too acidic and can break down the finish ultimately. The absolutely simple and safe way to clean any sort of wood that is finished with a urethane is to use polyurethane cleaners which are manufactured by both hardwood flooring manufacturers and manufacturers of polyurethane. Like Squeeky Cleaner from Basic Coatings. Any hardwood flooring supplier near you should carry this or similar product. Also, Home Depot is a likely place to look, since they do sell hardwood flooring. The cleaner is usually blue in color, and is mixed 4 parts water to one part cleaner in a spray bottle. Spray some on a cloth and wipe. Any wood finished with urethane top coats can be cleaned with it.